Whether you're looking for a creative storage solution or just a different way to display some of your favorite books or objets, consider a decorative ladder. (Or even a working ladder turned into a design element!) From rustic farmhouse chic to sleek and modern designs, a ladder can add dimension and style to a variety of spaces in your home. This dipped ladder from West Elm is more sleek than rustic, and perfect for storing (and displaying) throw blankets. We love the two-tone design, which gives it a stylish minimalist feeling. A ladder like this is a great small space storage solution, or a fix for a wall that needs something other than art. This ladder from Pottery Barn is already equipped to be a cool and unique storage idea. In the bathroom, the study or even the entryway, this shelving system incorporates the utilitarian look of a ladder with built-in platforms for displaying baskets artwork or stacking books artfully. This affordable teak ladder from Ibolili (who make lots of chic, slightly tiki wood furniture) is one of our favorites for its small size and simplicity. We would lean this against a wall in a cozy den or living room, perhaps using it to store and display magazines or blankets. The rustic all-white look of this decorative ladder makes it a stand-out from Anthropologie. Plus, we love that its under $100. We might follow their lead and use it to display towels in the bathroom, or throw blankets in the living room. This Joss & Main ladder is the sleek and minimal piece of our dreams! We love the unique iron design and single contrasting bar at the top. At just $54, this decorative ladder offers a stylish and useful point of interest for about the same price as a nice dinner out on the town. That's hard to beat, and this piece will be far more eye-catching than the leftovers in your fridge! For those in small spaces who might actually need to use a step ladder around the house or their apartment but have no where to hide it out of site, we love the idea of making it part of your decor. 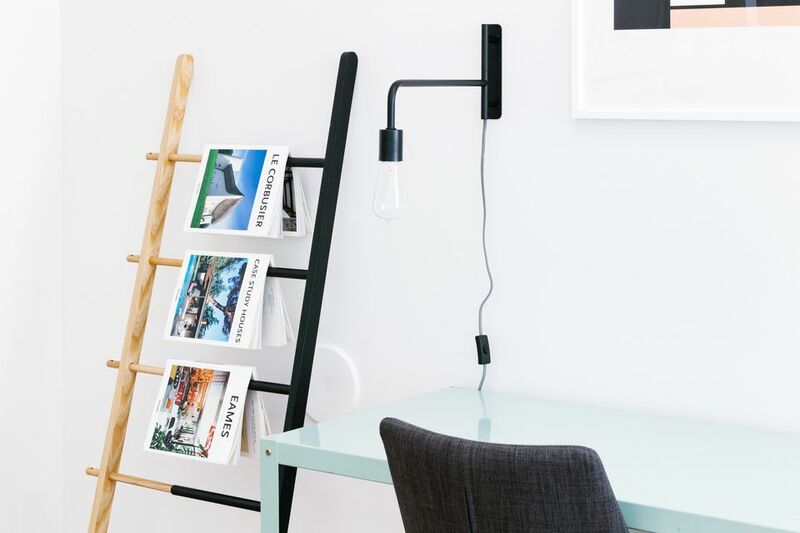 A small stack of books, a plant or some candles will make even the most utilitarian ladder look intentionally stylish. This iron towel rack from Create & Barrel is sleek and cool—perfect for an industrial design touch. We could see this piece looking right at home in a subway tile bathroom or honestly, a hallway where space is tight but the walls could use some interest. You could hang magazines or blankets from it, too. Rustic and simple with a hint of shine, this is the ideal decorative ladder to channel your cozy cabin or farmhouse vibes. We love the eclectic selection of pieces like this from World Market, that go so well with true vintage finds and even provide a nice contrast to more modern or minimalist design elements. This beautiful decorative ladder was handmade in Indonesia with mindi wood. We love that it has a clean modern look but still feels bohemian and rustic, too. Set it against a wall in the den or the living room and decorate it with a combination of throw blankets that add color and texture to your space. Orchard ladders are used around the world (and have been for centuries) to harvest fruit from apple, orange, lemon and other trees. The design is practical—the top purposely narrows so that it can be leaned against small tree branches without harming the soon-to-be harvested fruits. This version from Restoration Hardware has charming rustic details you'd never expect, like rungs that are "whittled at the ends to join the tapering uprights in mortise" and tenon construction.